To most non-Spaniards, the Spanish Civil War (1936-1939) is distant history, the stuff of Hemingway novels. 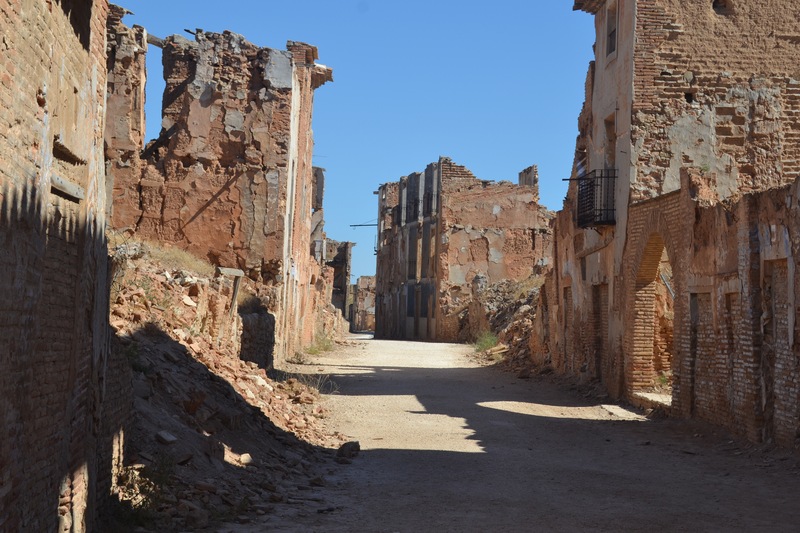 But to many Spaniards, the war can seem like yesterday – and nowhere is this more evident than in the town of Belchite. 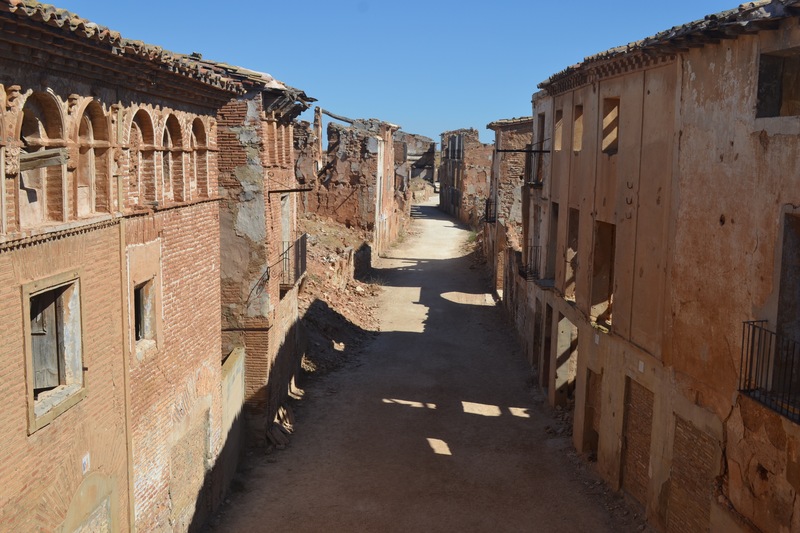 Belchite, home to about 2,000 people in Aragon, had a rough time during the civil war which began with a military uprising against the elected Republican government, a coalition of leftists. The rebels called themselves Nationalists and included the Fascist Falange party. They were backed by Nazi Germany. 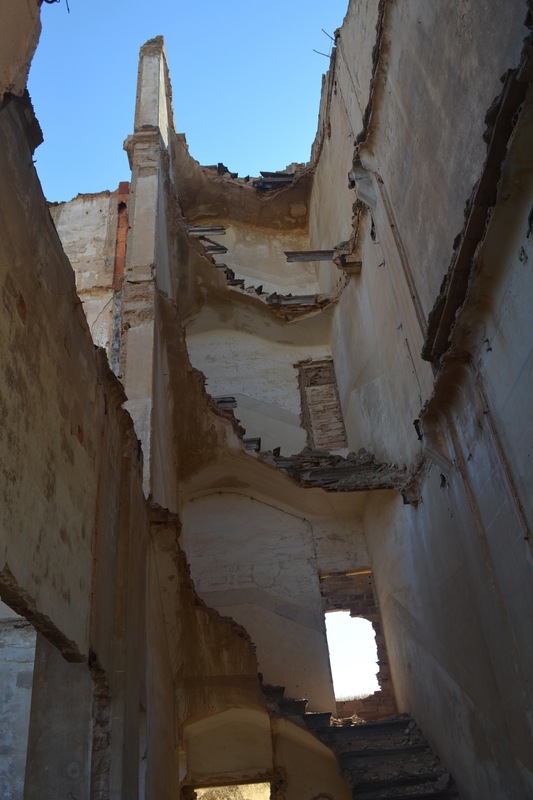 Belchite’s troubles began when Nationalists arrested and executed about 200 Republican-leaning residents. That slaughter prompted an all-out battle in August and September 1936, when the Republicans launched a fierce offensive against the Nationalists. 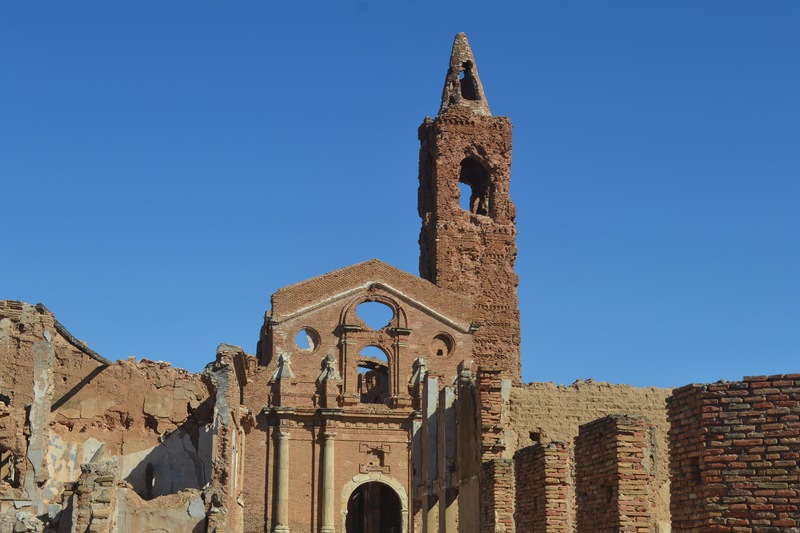 The 13-day battle devastated the town, and since then, the ruins of ‘Old Belchite’ have remained as a testament to the bloody combat that took place there — and as a symbol of Spain’s tragic civil war which left an estimated 500,000 dead. 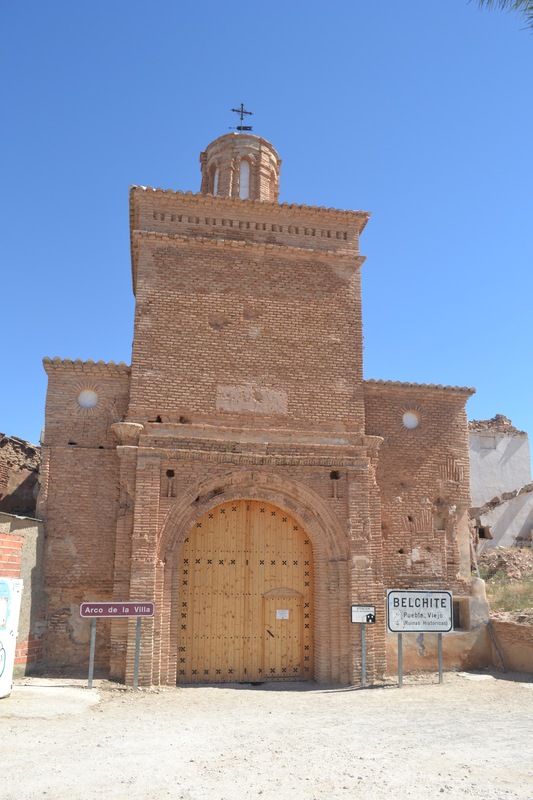 A visit to the town begins at the Arco de Villa, which marks the beginning of what was once Belchite’s High Street. Walking through the gate, one is immediately faced with the remains of the town. Every building is pockmarked by bullets, with most buildings also gashed by artillery shells. 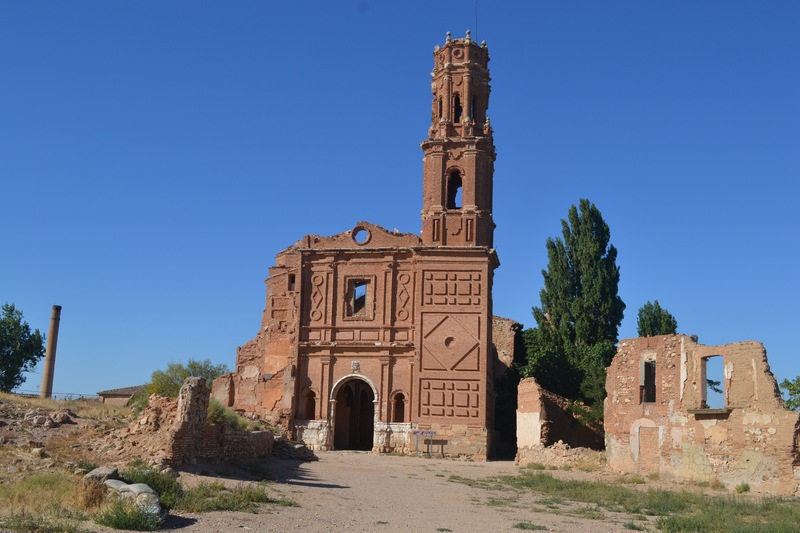 Among the most battered buildings in the town is the church of San Martin de Tours, which was built in the 15th or 16th century. 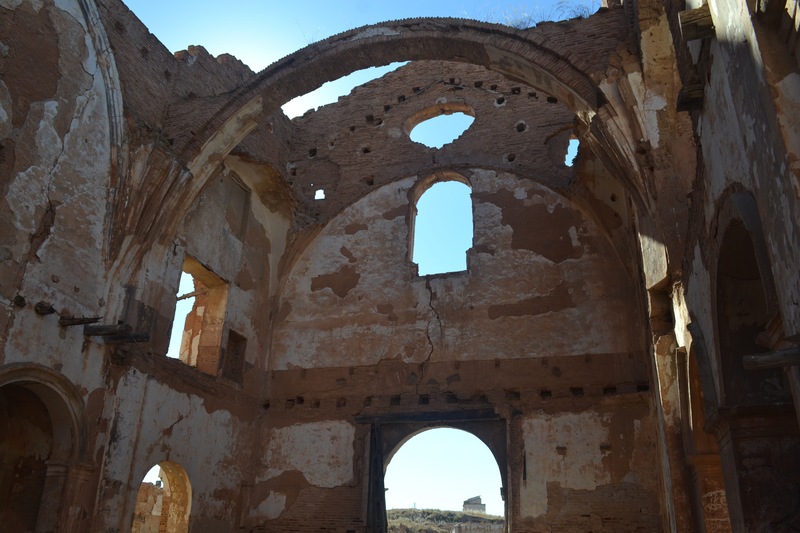 During the battle, the church was used as a field hospital and as a shelter by many of the residents, who thought that the solid walls would protect them from artillery fire and aerial bombardment. On September 2nd, however, the church’s main dome suffered a direct hit from an artillery shell and collapsed, burying many people alive. The remains of over 20 people remained hidden underneath the ruins. 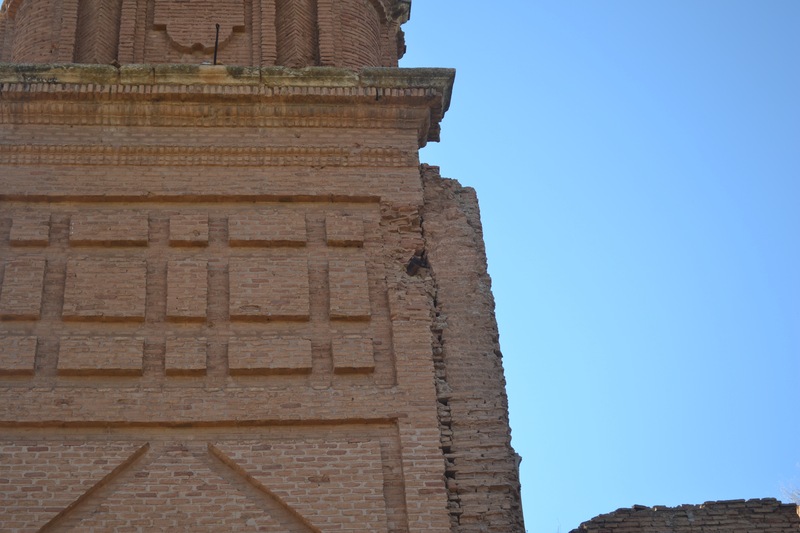 Another church, Iglesia de San Agustin, had it just as bad. The building – which is still decorated with plaster reliefs and images of saints – was taken only after intense hand-to-hand fighting. Interestingly, the unit responsible for taking the church – the “Lincoln Battalion” of the XV International Brigade – was made up entirely of American volunteers, part of the 32,000 foreigners who fought in the Republican’s International Brigades. Inside, one can clearly see bullet holes on the wall from the close-quarter fighting inside the confines of the church. 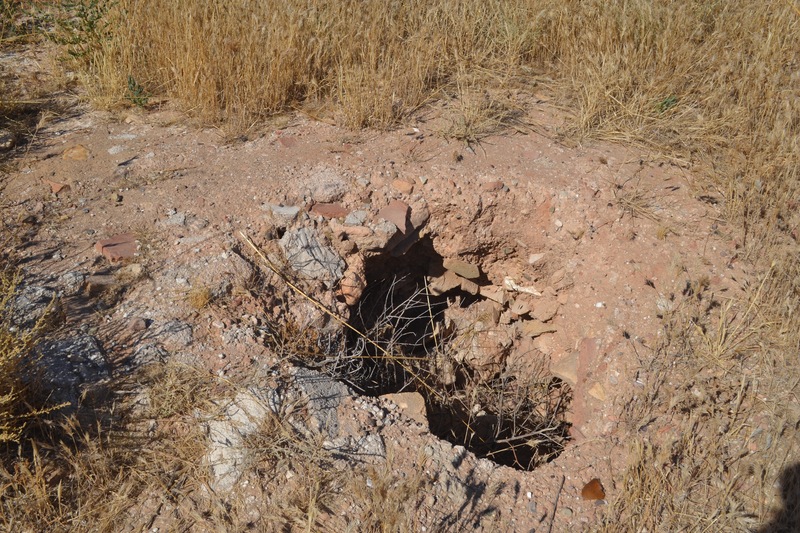 On the church’s exterior, an unexploded shell can still clearly be seen lodged in the tower. Nearby, there are remnants of a trench, part of the Nationalist defensive positions facing towards nearby fields. Belchite final fell to the Republicans on September 6th. Despite their victory and the positive international news coverage (part of the battle was covered by Ernest Hemingway), many Republican commanders were left wondering why so many men were lost taking a militarily insignificant town in the middle of nowhere. The town was eventually retaken by the Nationalists – with extensive German air support – during a March 1938 offensive in Aragon. The Lincoln Battalion took dreadful losses during what became known as “the Retreats”. 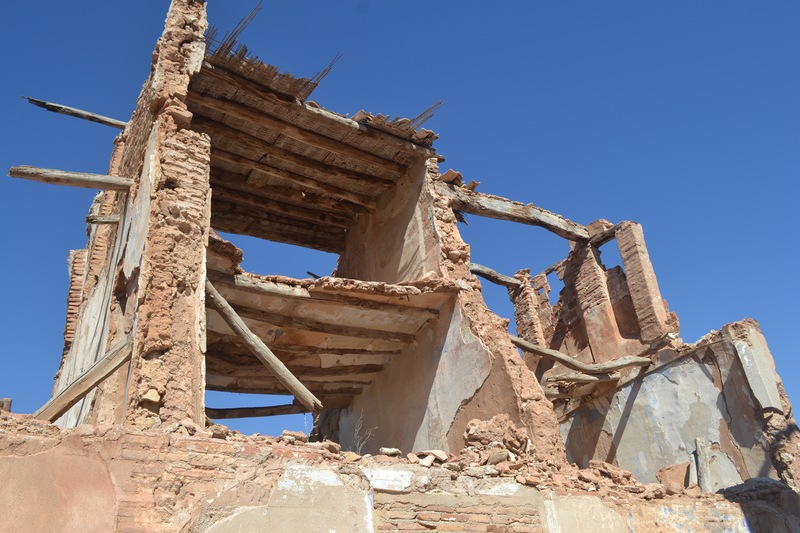 A cursory glance at the website of The Volunteer, the quarterly magazine of the Lincoln Battalion archives, shows that many Americans were killed in and around Belchite around this time. After the fighting moved away from Aragon, the town’s residents slowly began to trickle back in, only to find their homes destroyed. 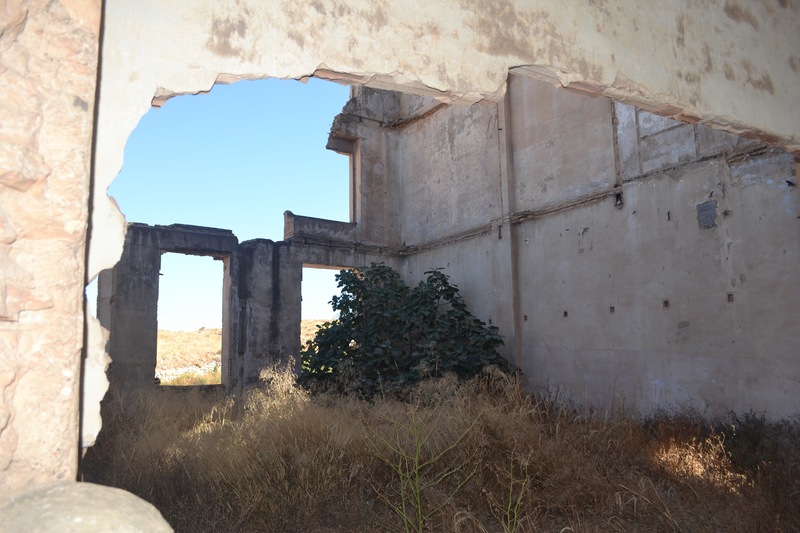 For political reasons (the propaganda value of a town destroyed by the defeated Republicans) the Spanish government of Francisco Franco decided not to rebuild the town, and between 1940 and 1954 a “new Belchite” was built and the old town abandoned. 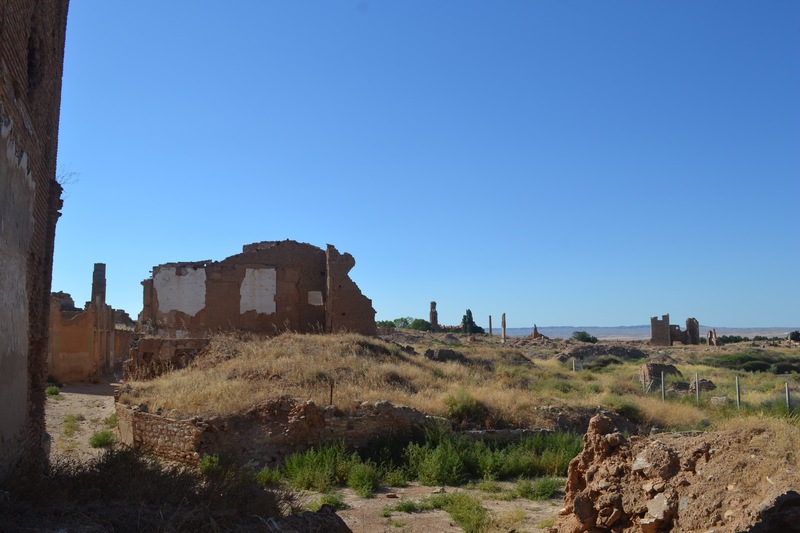 Notably, our tour of Belchite ended with the guide making a very pointed comparison between Spain’s civil war and Syria’s, with neighbors and friends turning against each other. He noted that after the war, thousands of Spaniards fled the country and now thousands of Syrians fled their country and came to Spain. 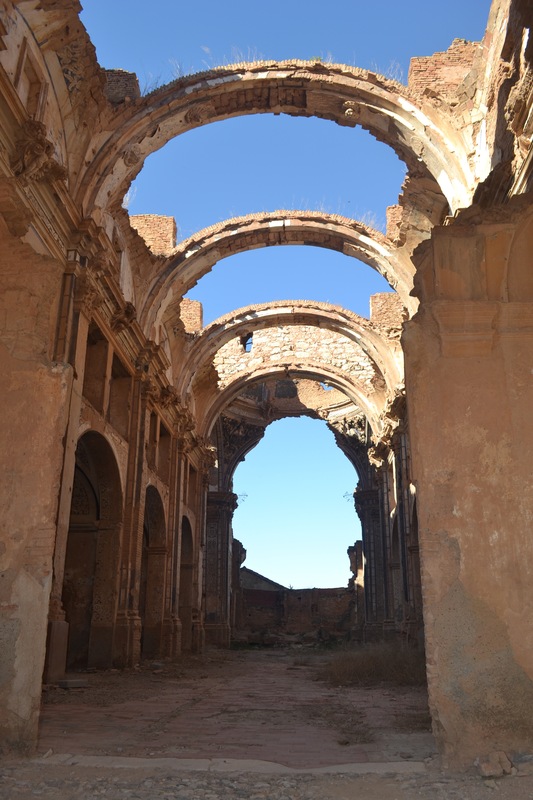 Tags: Arco de Villa, Belchite, Bernie Debusmann, Church of San Martin de Tours, Iglesia de San Agustin, Lincoln Battalion, Sarakshi Rai, Spain, Spanish Civil War, The Ruins of Belchite, XV International Brigade. Bookmark the permalink. good article guys. thank you for continuing to share your adventures with us and to bring stories like this to the world. So sad. We humans never seem to learn anything. Great article Mr. Debusmann and Ms. Rai. ANOTHER ONE FOR THE VELVET ROCKET.